While I still did not get to the coupons, I was able to get a little something accomplished this week. I wish it was more, but with only a few days left in the online semester, and another one of my children sick this week, I needed to cut myself some slack. The family room tree finally came down on Tuesday. We have 3 all together. The one in the front room can be seen in our large window and one in the bedroom. The front room and bedroom tree came down last weekend. 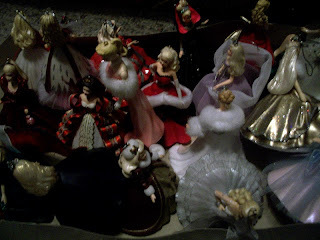 I did not have enough time when taking the tree down, to box up the ornaments into their individual boxes. You see I have been collecting Hallmark ornaments for just shy of 20 years. I have slowed down considerably in the last few years, but I still manage to have quite a collection. I laid all of the ornaments on the table in the corner, hoping to have time to get to them this week. The 21 Barbies in our Barbie collection. My daughters have always loved these ornaments. Kara still especially loves being the one to put them on the tree. 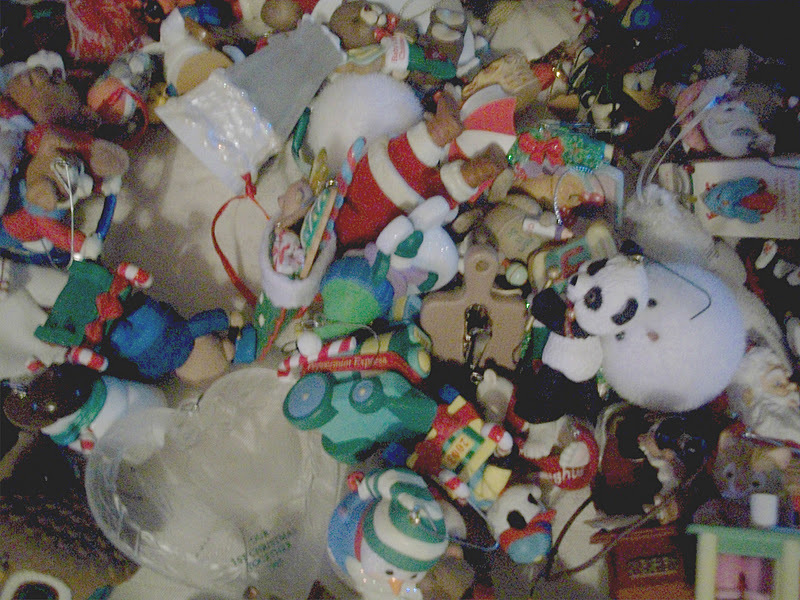 While boxing up the ornaments, I thought it might be interesting to see how many I actually have. Almsot every single one of them has a special meaning. All 3 of the kids have their own first 5 years series. Each one of them are given a special grandchild ornemant from my dad and step mom each year. The year I had a big birthday and a Halloween costume party, just happened to have an ornment with my costume that year. ( I was Glinda from The Wizard of Oz, and Kara was Dorothy.) We have new home ornments, favorite movie ornaments and Disney ornaments for the years we went to Disney. Even I was a bit surprised when I counted 117 Hallmark ornaments. 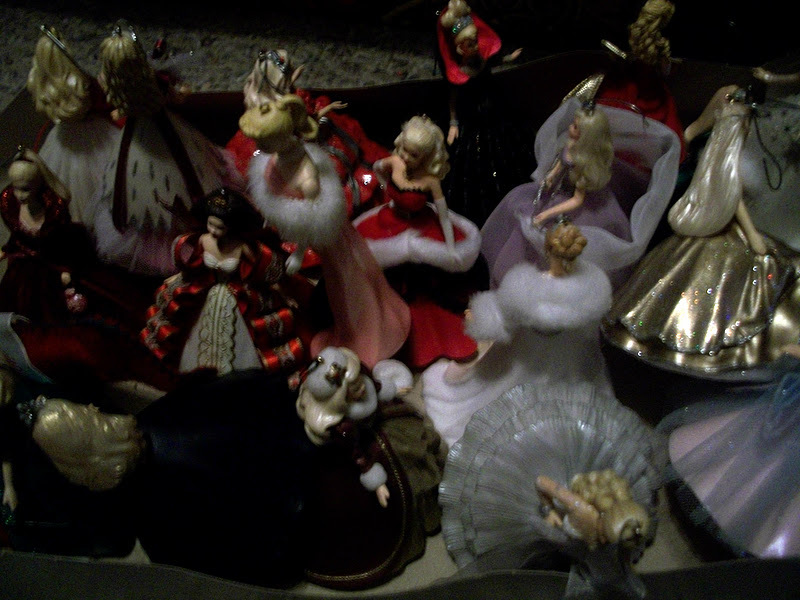 I also have 20 Campbells ornaments that I have collected since 1995. There were also 26 other ornaments on the tree. If you are counting that means we had 146 ornaments on our tree. Wow! Now I know why it takes so long to take down. It took about two hours to get them all boxed up and put away for next year. Just enough time to watch a movie at the same time. Plan for my daugthers 15th birthday next weekend.